How does a black hole/frozen star gain mass when it is surrounded by the event horizon and time is frozen? Time is frozen at the horizon only and for far observer only. For the mass falling in the black hole, time is not frozen. Atoms reached the central singularity in a time about 0.0001 seconds from the distance 30 km off the black hole of mass of 10 solar masses. But there will infinite time passed in the Universe. So, if you take into account the limited lifetime of the Universe, and that black hoels are formed by collapse of the star core, you may understand that true stellar black holes does not exist. There exis a asymptotic black hole" - a dense blob of mass that reminds a black hole, but have no event horizon, only some mathematical surface, at which time is so decelerated, that matter is not have enouth time to cross it until Universe dies. Right, I know that matter at the event horizon would not experience any slow down but likely it would never get there since the universe would collapse in on itself at the end of it's life. So with a black hole it stops growing and basicly pauses once it has sufficient density to create an event horizon? Why are there larger and smaller black holes? shouldn't all black holes be the same because as soon as enough mass is compressed to create an event horizon, that is the end of it. How are there giant black holes at the heart of galaxies? I did not really understand everything in your last sentence. Why do you say the universe would collapse? The best evidence we have thus far suggests an ever-accelerating expansion possibly until all things are eventually torn apart. If not all the time in the universe will allow us to observe the actual collapse of sufficient matter to form an event horizon since it would also cause the time to appear frozen there just as it happens, the mass that we can detect is not the mass inside the black hole, but the mass inside the horizon just before it becomes a black whole plus the mass about to cross the event horizon, the "asymptotic black hole", which might vary and increase. But I find this highly confusing. If a lot of matter falls towards the hole, but appears to slow down as it approaches the event horizon, wouldn't we also observe that the mass gets incredibly dense near the horizon, which itself should push the horizon outwards and matter would actually cross the horizon while we watch? I think the universe would collapse at the end of it's life because expansion requires energy, when the expansive force is less than the gravitational pull of all the matter in the universe, the universe will contract into a single point. Perhaps this is when the big bang happens again? Yes I think the event horizon would become dense and matter in the event horizon would push up against matter in the event horizon. Matter frozen in time in the event horizon would act as a hard surface impossible to nudge and non frozen matter would accumulate on top of the event horizon assuming matter frozen in time can not be pushed by an outside force. Perhaps that is what SE ment. I have heard of rotating black holes and apparently the only information they can contain is speed of rotation and mass. I am not sure but I have heard that rotating black holes can eject mass. In a pure mathematical sense, it is correct that black holes do not really exist from an external perspective because the observed in-fall time is infinite. What you see is everything that ever fell into the black hole sort of smeared over the event horizon (this is the solution to what happens to the information content of what a black hole eats). However, objects falling into an event horizon are red-shifted so quickly that in practice there's no real difference -- black holes still look like black holes. The best evidence we have thus far suggests an ever-accelerating expansion possibly until all things are eventually torn apart. Evidence indeed shows the universe should undergo expansion forever. The Big Rip is a little different though, and its occurrence depends upon the value of w (the ratio of dark energy pressure to energy density). If w is less than -1, then the scale factor of the universe becomes infinite and a Big Rip occurs. If it is equal to -1 then the Big Rip occurs an infinite time in the future (boundary condition), and it never occurs if w is greater than -1. Right now we can't constrain w well enough to distinguish between these cases, though it seems to be pretty close to -1. According to this 2008 paper we have it down to -1.02 (+0.13 -0.19). If a lot of matter falls towards the hole, but appears to slow down as it approaches the event horizon, wouldn't we also observe that the mass gets incredibly dense near the horizon, which itself should push the horizon outwards and matter would actually cross the horizon while we watch? The gravitational field of a hollow sphere is equivalent to the gravitational field of a point-mass at its center. So no. A basic rule of thumb here is that the location of the event horizon should be independent of one's frame of reference, and no observer can ever see a particle cross an event horizon. The big bang describes how space itself has expanded, but does it follow that if all matter in the universe eventually pulls together to a single point within space (leaving an enormous void around it), space itself will also become so warped that it collapses into a point as well? Perhaps you should familiarize yourself with something called "dark energy". Compare the expansion of the universe to a ball thrown up into the air. The ball ascends because it was given kinetic energy. What will the fate of the ball be? Will it continue to rise forever, or will it fall back to Earth? The answer depends on two parameters (ignoring the effect of friction) -- the initial velocity of the ball, and the strength of gravity which acts to pull it down. In our analogy to the universe, this is like the expansion rate being due to the Big Bang, and it slows down because of the combined gravitational field of the matter it contains. Now for the speeds at which I can throw a ball, obviously the ball will slow down and fall back to the ground. This is like the universe's expansion slowing down and eventually collapsing on itself. (This is called a 'closed' universe.) But if the ball were thrown fast enough, called the escape velocity (for the Earth this is about 11 kilometers per second), it would keep going up forever! A similar idea holds for the universe: if the density of matter in the universe is too small, then its self gravity cannot stop the expansion, and the universe expands forever. (This is called an 'open' universe). Here's a graphic to show what I'm talking about: the curves represent the size of the universe as a function of time, depending on how much mass it contains. For a long time cosmologists wondered what the fate of our universe would be, and it turns out that the mass density is very close to that critical density. This is the middle curve in the above graphic. 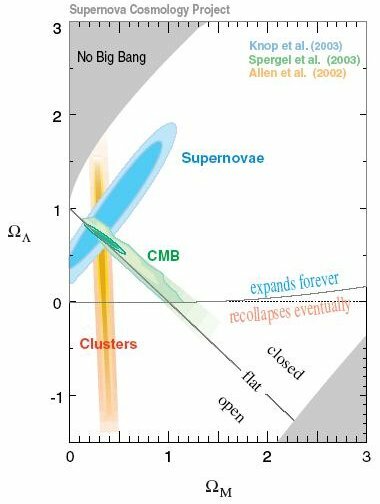 Such a 'flat' universe will never collapse, but its expansion rate slows to zero after an infinite amount of time. This is how we thought the universe would evolve until fairly recently, when it was discovered that the expansion of the universe isn't actually slowing down -- it's speeding up! There's a strange force (really, an energy) which speeds up the expansion rate, and we call it 'dark energy'. This is a graphic showing how the evolution of the universe depends on the quantities of matter (ΩM) and dark energy (Ωλ). The intersection of the data shows that the universe is very close to flat (the mass density is very close to the critical density), but will expand forever because of dark energy. You might be wondering why it says "No Big Bang" in the upper left corner. This is because a universe with those parameters would begin at a low density state; unlike the high density state of the Big Bang as our universe did. midtskogen, I don't think so, because what matters is the average mass density. I think in your scenario you'd just get a (very) massive black hole surrounded by vacuum, and the universe would still expand.